David Blum, (1935-1998) was principally known as conductor of New York's Esterhazy Orchestra. His recordings of Haydn symphonies with this ensemble and of Mozart works with the English Chamber Orchestra won him international acclaim. Casals took a warm interest in David Blum's musical activities and in 1961 became Honorary President of the Esterhazy Orchestra. 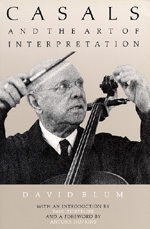 The notes for this book were taken at innumerable rehearsals and master classes in Prades, San Juan, Marlboro, Zermatt, and University of California and elsewhere, as well as in many private discussions with Casals.